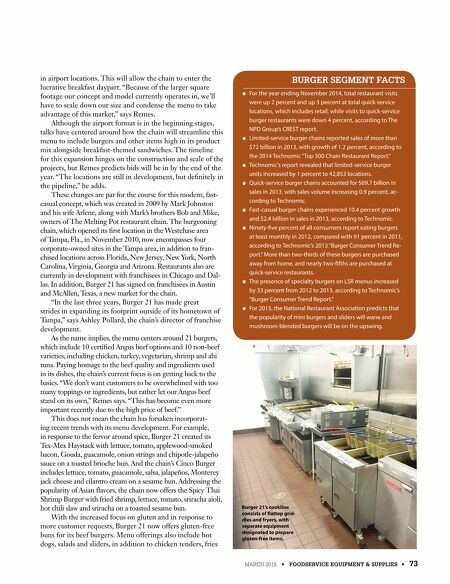 72 • FOODSERVICE EQUIPMENT & SUPPLIES • MARCH 2015 BURGER BUSINESS REMAINS A BONANZA e&s segment spotlight Despite the well-documented troubles some of the larger chains continue to experience, consumers' appetites for burgers remain as strong as ever. The key to success in this crowded and competitive segment is an evolving menu that features high-quality ingredients, paired with a versatile equipment package that brings these favors to life. Here we look at two operators who continue to accomplish this. 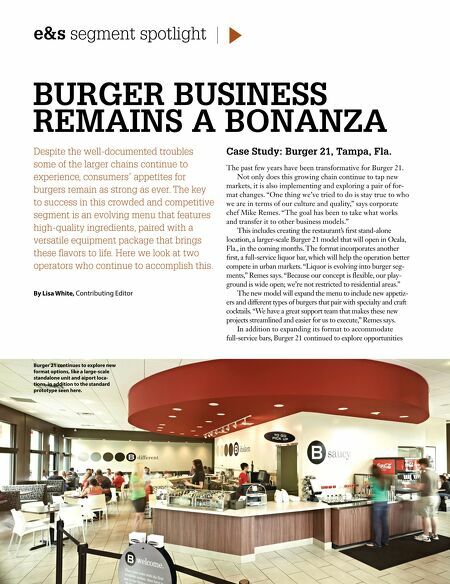 By Lisa White, Contributing Editor Case Study: Burger 21, Tampa, Fla. The past few years have been transformative for Burger 21. Not only does this growing chain continue to tap new markets, it is also implementing and exploring a pair of for- mat changes. "One thing we've tried to do is stay true to who we are in terms of our culture and quality," says corporate chef Mike Remes. "The goal has been to take what works and transfer it to other business models." This includes creating the restaurant's frst stand-alone location, a larger-scale Burger 21 model that will open in Ocala, Fla., in the coming months. The format incorporates another frst, a full-service liquor bar, which will help the operation better compete in urban markets. "Liquor is evolving into burger seg- ments," Remes says. "Because our concept is fexible, our play- ground is wide open; we're not restricted to residential areas." The new model will expand the menu to include new appetiz- ers and different types of burgers that pair with specialty and craft cocktails. "We have a great support team that makes these new projects streamlined and easier for us to execute," Remes says. In addition to expanding its format to accommodate full-service bars, Burger 21 continued to explore opportunities Burger 21 continues to explore new format options, like a large-scale standalone unit and aiport loca- tions, in addition to the standard prototype seen here.